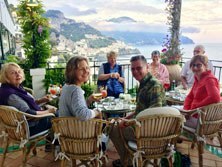 Our tour begins in Sorrento - the gateway to the stunning Amalfi Coast. This 25 km long peninsula, rising to more than 1,400 metres, has an extensive web of magnificent paths, many of ancient origin. Well above the busy coastal towns, we walk through hamlets, citrus orchards and vineyards on the mountainside. 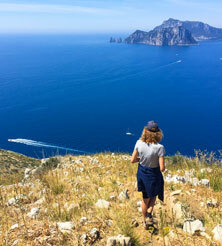 A highlight is our magical walk on the enchanted island of Capri. It is also possible to visit the famous Vesuvio, which entered the history books when it erupted in 79AD. In the space of two days the Roman settlements of Pompeii, Ercolano, Stabia and Oplontis were wiped out. Today the volcano's reputation as a merciless destroyer has been greatly diluted and you can walk in Vesuvio National Park, established in 1991. On your free day you can visit Pompeii where you can find the richest insight into the daily life of the Romans. We move onto Peschici on the Gargano Promontory. It offers dramatic scenery and its high rocky spur plunges into the Adriatic Sea, broken here and there by small beaches. In the Abruzzo Mountains the wild landscape exerts a strong influence. They are dominated by the Appennines and the hinterland forms one of Italy's last remaining wildernesses. At 2,912m, the highest peak is Gran Sasso. 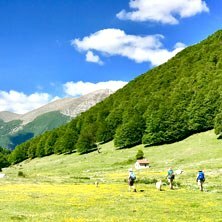 A particularly beautiful area is the Parco Nationale d'Abruzzo. It is one of Europe's most important nature reserves with a rich landscape of high peaks, rivers, lakes and forests. Once hunted almost to extinction, the park now boasts 100 brown bears. 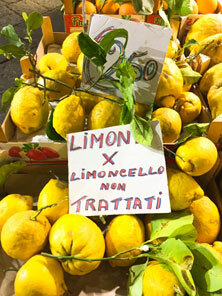 Our route continues to Umbria - the "Green heart of Italy". This region contains some of Italy's most outstanding medieval hill towns - Orvieto, Assisi, Spello, and Spoleto are just a few. They also house some of Italy's oldest churches along with Roman and Etruscan remains. Such countryside yields many delicacies - trout, olive oil and the prized truffles. Norcia, our base for the next 3 nights is ocated in the heart of the Appennines and the Monte Sibillini National Park, and already founded 600 years before Rome. It bears the mark of a long and colourful history: ancient city walls which are still standing, major monuments and a wealth of art. 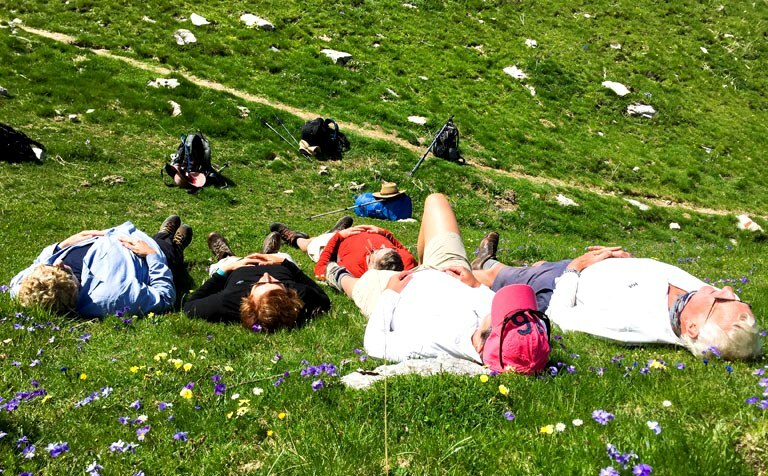 Our walk takes us through the Sibillini National Park, which was founded in 1993 in the land of the mythical Sibyl tribe. Wolves, golden eagles, pilgrim falcons and many other native species are the most evident signs of a varied and rich fauna. The charm of abbeys and medieval villages, scattered in the form of a crown at the foot of the mountains, have created an ancient and evocative world. Even today, time seems to have stopped to pay homage to such extraordinary beauty. On our way to Florence we travel through Assisi and spend the morning visiting this famous town. Our walk ends in Florence where you have excellent rail connections in many directions. 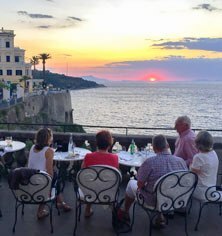 Our first 3 nights we stay at a charming hotel in Sorrento is situated in the centre and just a short distance from the seafront. 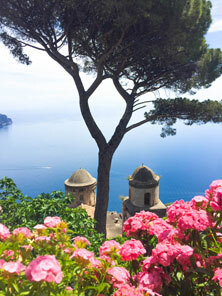 From the hotel you can enjoy the stunning views of Sorrento and the beautiful coastline. Its lovely restaurant offers a flavoursome cuisine, based on fresh vegetables, fish and seafood. 4 nights are spent in a peaceful hotel at the harbour in Peschici. Here the local cuisine is enlivened with seafood, fruity green olive oil and dry white wine. The fresh vegetables and huge bursting tomatoes account for one of the healthiest diets in Europe. During our stay, Arcangela's mother spoils us with some of the best Italian home-cooking and her fish soup alone is worth the visit. During the next 3 nights we stay in an elegant art nouveau country house, set in a large park with century-old trees, centrally located in Pescasseroli. It was the former residence of the family of the well-known Italian philosopher and politician, Benedetto Croce. The restaurant of the hotel boasts a choice of classic cuisine or traditional regional specialties. Our final 3 nights we stay in the magnificent Palazzo Seneca in Norcia. Our dinners will be taken in the elegant ambience of our hotel, a one star Michelin restaurant and also at the Ristorante Granaro del Monte, originally the main grain store of Norcia, built for protection within the town walls. This building is now classified as a National Monument. It has 5 medieval halls, transformed into elegant banqueting rooms and furnished in the medieval style. The "Granaro del Monte" is known as one of the most outstanding restaurants in the region and allows you to discover the authentic flavours of Norcia's gastronomic traditions. On the menu we can find tagliolini noodles with truffles, spelt soup, fettucine with wild boar and many other specialities. 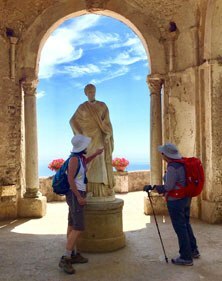 Departure dates have been arranged to allow the "Epicurean walk in Italy" and "On the Snail Trail" walks to be combined.